In roughly 30 years as a professional writer, Linda has written hundreds of articles. Below are recently published stories and favorite projects. Please contact Linda if you’d like to see more writing samples. Some older narrative projects cannot be posted because of copyright issues. 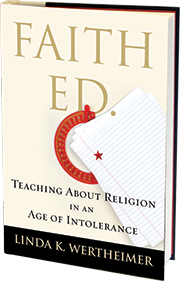 This new section includes articles stemming from my book, Faith Ed, Teaching About Religion In An Age of Intolerance. Defeating Hate. Story in The Islamic Monthly magazine examining whether teaching about religion can reduce ignorance – and hate. March 4, 2016. Our Children Need to Learn about Islam. This op-ed ran online in the Atlanta Journal-Constitution on Oct. 2, 2015, and was to appear in print editions on Oct. 12. Some parents in an Atlanta-area town complained about lessons on Islam, a common refrain around the country. This gives my take. Ahmed Mohamed and the Problem of Religious Intolerance In Our Schools. Summary: This op-ed, published on WBUR’s Cognoscenti opinion section on Sept. 25, 2015, shows who the story of Ahmed Mohamed reminded me of the Muslim youths I met around the country while reporting on my book. Our school’s Rosh Hashanah Gift: The Day Off. Summary: This op-ed, published on WBUR’s Learning Lab website on Sept. 11, 2015, describes the positive effect of a school system giving religious holidays off for minorities, but also covers the complexity, given no schools could give all holidays off. Public schools should not preach but they can teach about religion. Summary: This Sept. 8, 2015, op-ed in The Washington Post uses material and reporting from Faith Ed. to make the case why it’s so important for schools to do more to teach about religion. New Clash over Religion in Schools: Communities Face Backlash for Lessons on Islam. This piece, published Aug. 25, 2015, on religionandpolitics.org covers a reoccurring theme in Faith Ed., how lessons on Islam often led to controversy. It drew more than 6,000 likes on Facebook and heated debate in the comments section. Not In Our Town: How A String Of Swastikas And Other Vile Graffiti Actually Made A Community Stronger: Summary: This Aug. 9, 2015, Boston Globe Magazine cover story stems from a sliver of my prologue of Faith Ed, a look at how a string of anti-Semitic incidents roiled the tiny town of Bedford and brought it closer together. 5 Ways to Teach Religion to Kids. An Aug. 17, 2015, post on the Patheos Natural Wonderers blog giving tips to parents on how to teach about the world’s religions to your children, whether you ascribe to a religion or not. 5 Ways to Avoid Controversy When Teaching about Religion. My post on Beliefnet, published in Aug. 2015, about ways teachers can avoid controversy when they’re teaching about religion. Ten Best Practices for Writing about Religion.. Tips on religion writing in The Writer magazine. June 2015. Calling Out Her Name: Lilith Magazine published my essay on healing, prayer and my mother’s struggle with Parkinson’s Disease in its Summer 2017 issue. “Modim” – Summary: Tiferet, a spiritual literary journal, published an essay of mine, Modim, in its Fall 2014 issue. This essay stems partly from my yet-to-be-published memoir about losing my brother and finding faith and partly from my experiences with post-partum depression. Best Feeling in the World: Readers Write, The Sun– How would you describe the ‘best feeling in the world?” Read my answer, published in The Sun magazine in April 2012. Jew Girl– Veteran journalist Linda K. Wertheimer, who’s writing a memoir about the loss of her brother and her journey closer to faith, chronicles how being the only Jews in public school bonded her and her brother closer in this excerpt. It was published in March 2012 in Tiferet Journal’s Fifth Bridge edition, a collection of winning essays from the publication’s 2011 contest. What’s a Fan to Do When a Star Acts Badly?– Mel Gibson was at it again recently and reportedly lobbed anti-Semitic slurs at a colleague and made an awful joke. My quandary: I like Mel’s movies and own three. Should I keep or toss them? My musings ran in The Boston Globe magazine’s Perspective section. Make Hanukkah about the Gifts that Count– Summary: How can we make Hanukkah more about a celebration than about a shopping frenzy? In a November 2010 article for The Jewish Advocate, I described my family’s attempt to downplay gifts in favor of togetherness and celebration. To read the article, published in The Jewish Advocate, click here. Don’t Call Me Grandma– Summary: In a tongue-in-cheek piece, I respond to getting called Grandma when I’m out and about with my 3-year-old. I wrote this for Kveller.com, a national Jewish parenting website. Read the article. No synagogues, please: Groups woo families in cafes, My Gyms – Summary: Jewish organizations around the nation are trying to woo young families through meet-ups, activities outside of shuls. My article for The Forward, a national Jewish weekly newspaper, ran online on Dec. 22, 2010, and ran in print editions on Dec. 31, 2010. Read the article. Teaching about the ‘Alt-Right’: Summary: In the 2016-17 school year, I was shadowing a pair of Brookline High School teachers for a longer project on their class about race. Over a few classes, they taught about the ‘alt-right movement’ and how it has become better known due to the 2016 election of Donald Trump. But how common is it to teach such a controversial topic? My April 4, 2017, story in the Atlantic looks at how it is taught and who is willing to teach it. Why Black Lives Matter Belongs On Lesson Plans Summary: How can teachers teach about race in today’s tumultuous times? This Boston Globe Magazine article examines what some teachers are doing to engage students in dialogue about race and educate them about racial turmoil of past and present. Perfecting the Art of Slowness (An Essay on the Writing Life)– Summary: Music has shaped so much of what I’ve become as a writer, and I write a riff on how music has influenced my writing in recent years for the Off the Cuff feature in the December 2011 issue of The Writer . Read the article. Interview with Dani Shapiro for Writer magazine – Summary: Dani Shapiro, author of Devotion, a memoir about her journey toward faith, talks about what inspires her as a writer in an interview I conducted with her for the February 2011 issue of The Writer . Read the article. Editing job improved my writing – Summary: Spending three years as an assistant city editor at The Boston Globe taught me valuable lessons as a writer. Read my Off the Cuff column in the July 2010 issue of The Writer about the lessons I put into practice. Read the article. Novelist’s gift is priceless: retreat for writers– Summary: In search of space and time to work on my memoir, I spent two weeks at novelist Jacquelyn Mitchard’s writer’s retreat on Cape Cod. I wrote about the program in the January 2010 issue of The Writer magazine. Summary: In Brewster on the Cape for two weeks for a writing retreat, I fell in love with bucolic town and discovered books set there by novelist Sally Gunning. The author gave me a tour — and this travel piece was the result.